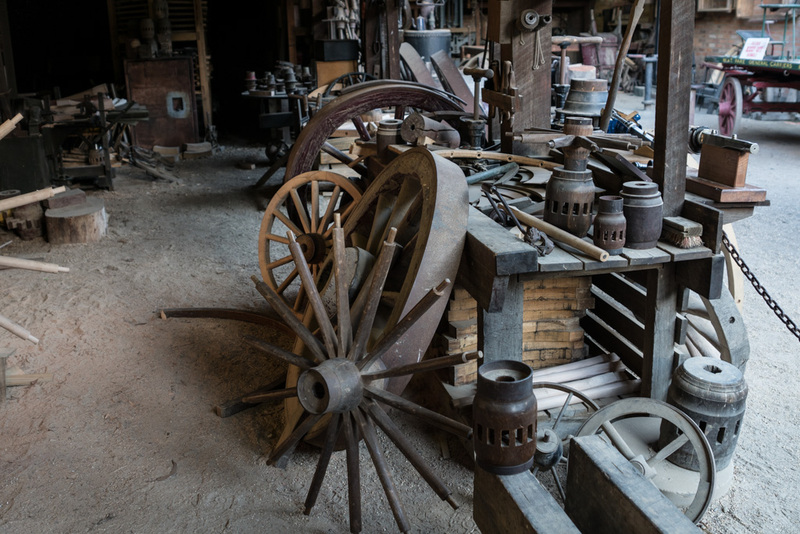 By far and away, my favourite area of Sovereign Hill is the wheelwright’s shop. 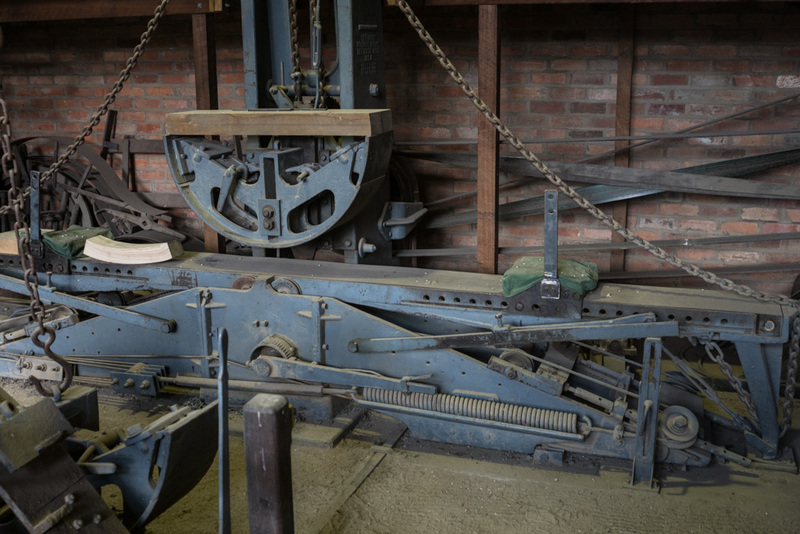 This is a fully functional 1880s/1890s industrial revolution vintage workshop, full of line shaft driven machinery, and some really cool specialist machines at that. Machines need power. 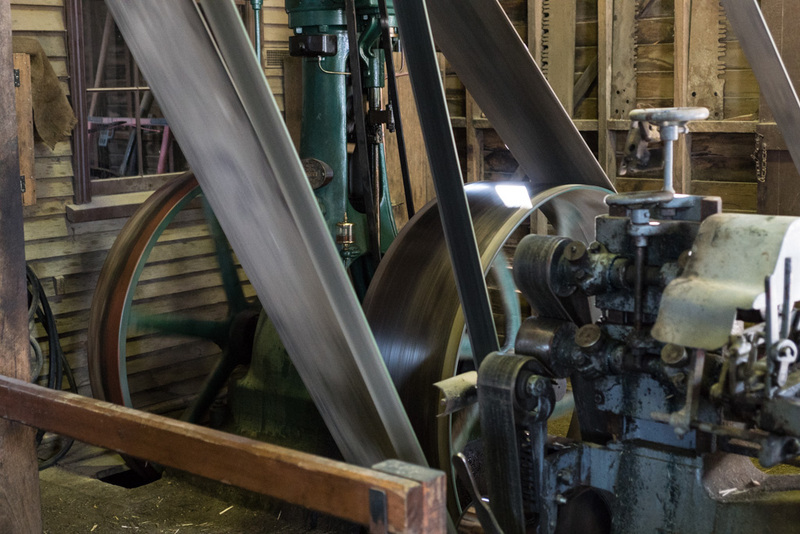 It can be horsepower (literally), water power (waterwheel), but what really rocked the industrial world was steam. I mean really rocked the world – it was (and still is) an incredible way to transfer energy from fuel to a mechanical form. Not 20 years ago, I was still working on a steam powered warship (which used the more traditional method of flame in a boiler), but even today, nuclear power is still fundamentally a steam system, just with a different source of heat. 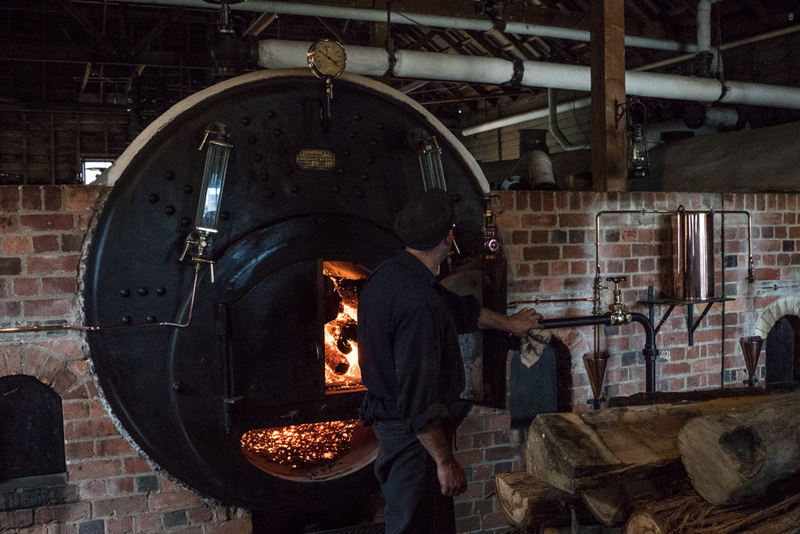 Sovereign Hill has wood powered boilers to drive the place. They run at a pretty minimal level compared to how much demand there would have been with the place rocking “full steam” at the end of the 19th century, but they still go through an entire tree a day (and no, I don’t see that as particularly wasteful, or even a lot in any respect). 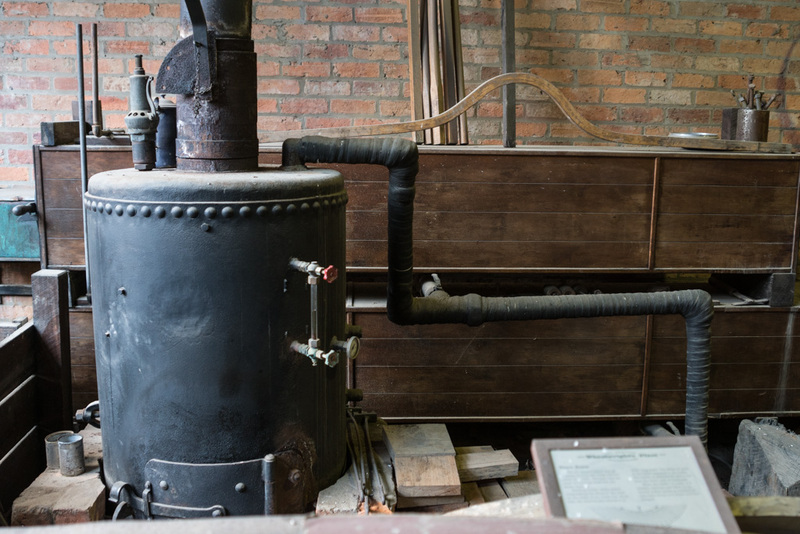 The steam produced here is saturated steam, so it is not particularly high temperature or pressure, but is still more than enough to drive the steam engines around the place. 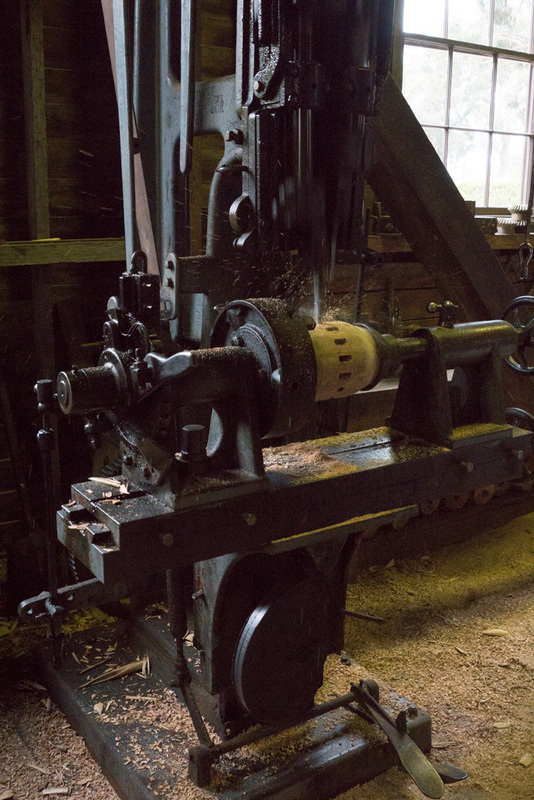 In the wheelwright workshop, the engine sits in one corner, and drives a really significant pulley and belt. 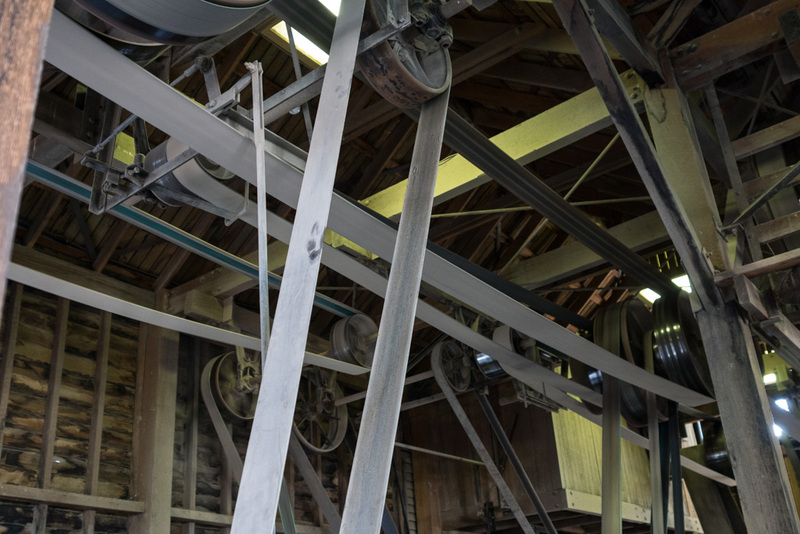 This is then distributed by a series of shafts, pulleys and belts to the various areas of the workshop. First step, after choosing a suitable round of timber, and knocking the bark off, is to drill the central hole. Once, this would have been done by hand with an auger bit…..
…. but a boring machine turns a difficult and tedious task into something a whole lot easier, and faster. The timber is processed green, very green, so it machines really easily. It does mean that there is a long drying time involved in the process, but more on that later. 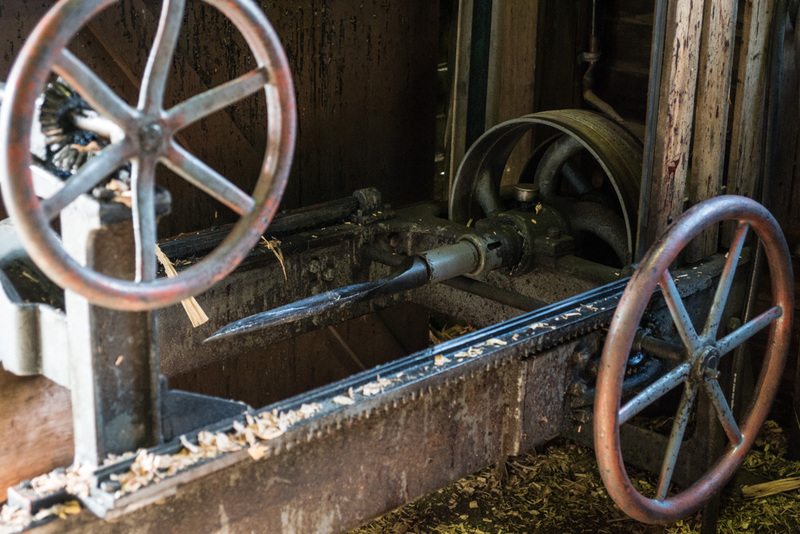 When you watch the video, look at just how much moisture pours out of the hole as it is drilled through, and in a number of steps, the amount of steam coming off the timber as it heats up from being worked. The drill bit doesn’t exactly look as you’d expect, but it is the shape that works best in drilling with the grain, deeply through the core of a log that is very wet/green. 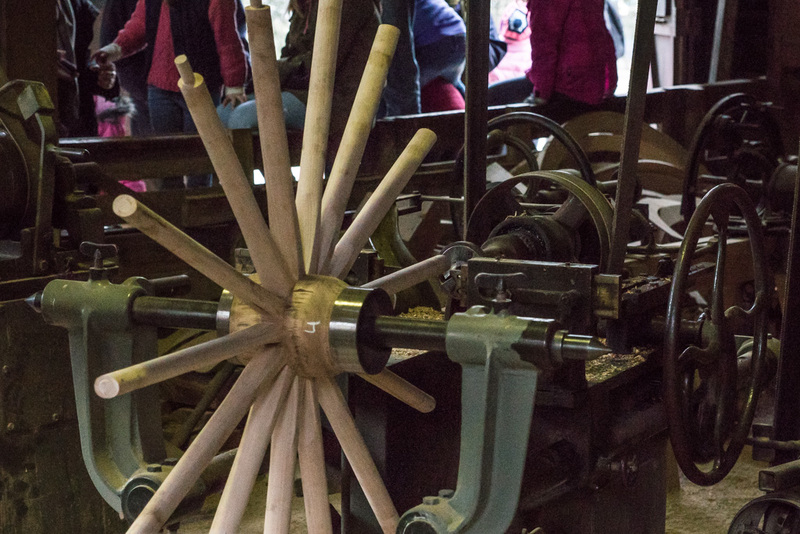 The wheel on the right moves the log back and forward, plunging it into the drill deeper and deeper each time, until it pierces through to the other side. The operator has to back off very frequently to clear the shavings. 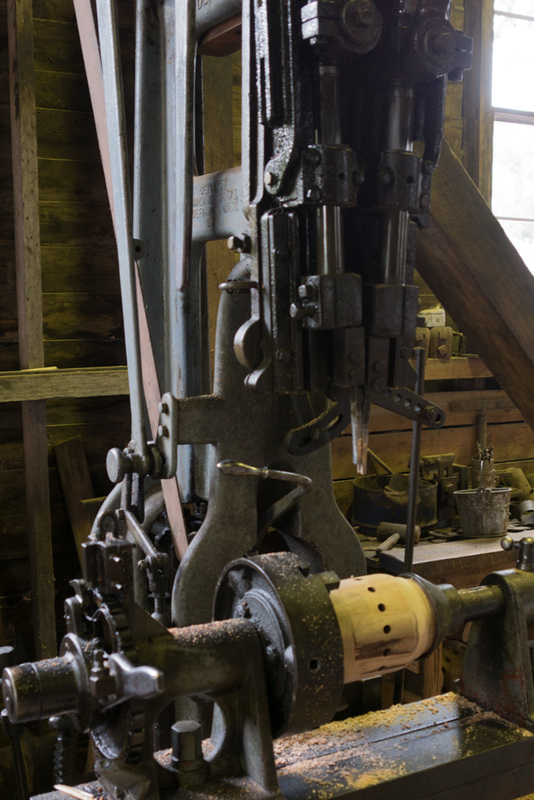 A square-ended shaft is rammed into this hole, for mounting in the next machine – the hub lathe. This has two cutting sides. 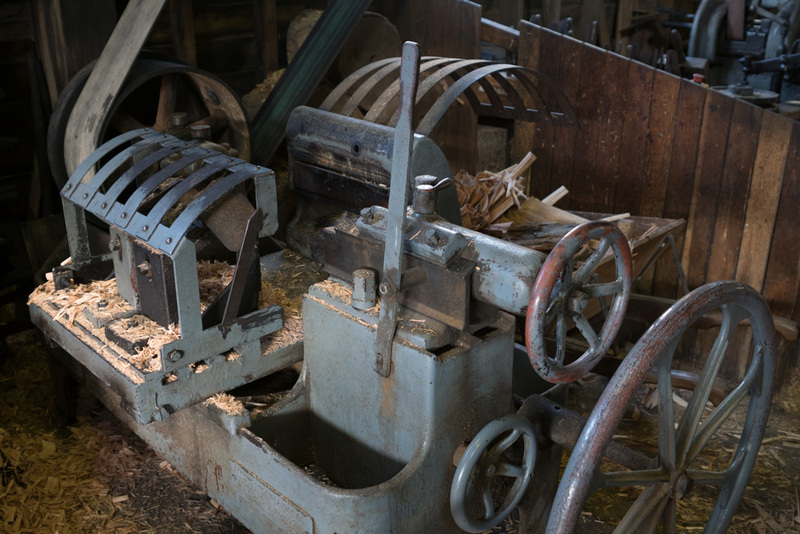 The right hand side planes the hub down to the correct diameter, then the blades on the left are bought to bear to shape the ends, and gently radius the hub along its length. With the wood being so green, the timber peels off in a sheet, in quite spectacular fashion. Easy to imagine this is not dissimilar to how ply is made. The hub then moves over to the mortising machine. There are a couple of steps that this machine does. The first is where it drills holes around the circumference, which allows the morticing chisels to work with a lot less effort. The second step involves the morticing chisels that cut with quite a punching action – very violent, but also very controlled. The machine automatically raises as lowers the hub into the chisels via a large cam on the front, and indexes from one hole to the next via a auto-advancing mechanism on the left. It is really impressive! The hub is then shelved. For years. I don’t have any photos of the spoke manufacture, but you can see more in the video anyway. 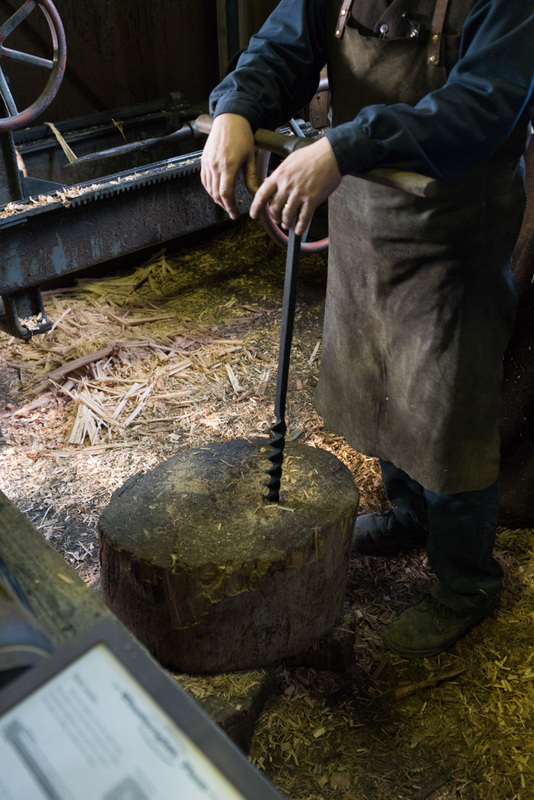 The lathe creates the oval spoke, with a square end. Next, a quick pass through a tenon former creates the initial shoulders, that will then be refined once the spoke has been seasoned. The third machine shaves a small amount off the circumference of the spoke, near the hub end. This is a deliberate weak spot, that allows the spoke to flex and absorb vibration, not unlike the narrow portion of a hammer handle. A spoke only takes a few minutes to make with this method, saving hours of work with planes, saws and spoke shaves. Once the spokes and hub have seasoned, it is remachined to final dimension (after all, there is quite a bit of timber movement during drying), and then assembled. The spokes are hammered home, in every second hole, creating the wheel spider. It is obvious where this name came from. The spider is assembled in this way, other the increasing buildup of forces in the hub from each spoke would cause it to explode apart by about half-way around. 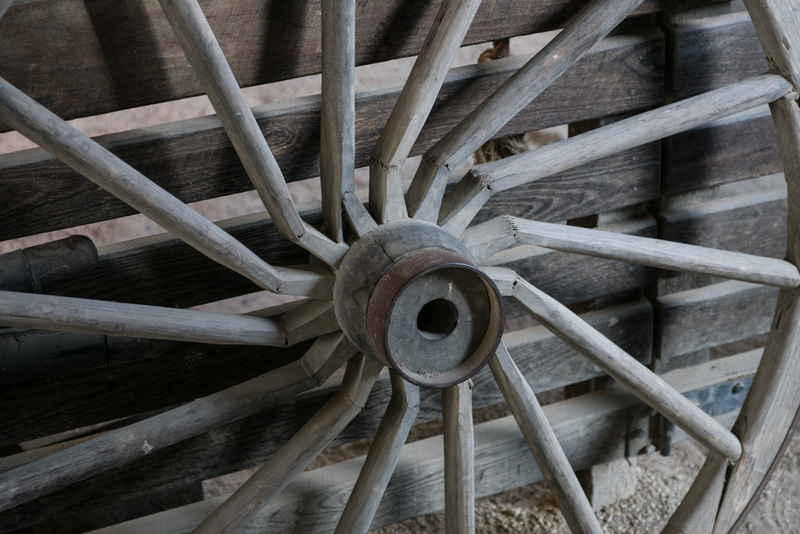 The spokes are not secured in by any method, other than friction. Round tenons are cut on the outside edge with another machine. This is pretty manual, but looks easy and quick to operate. 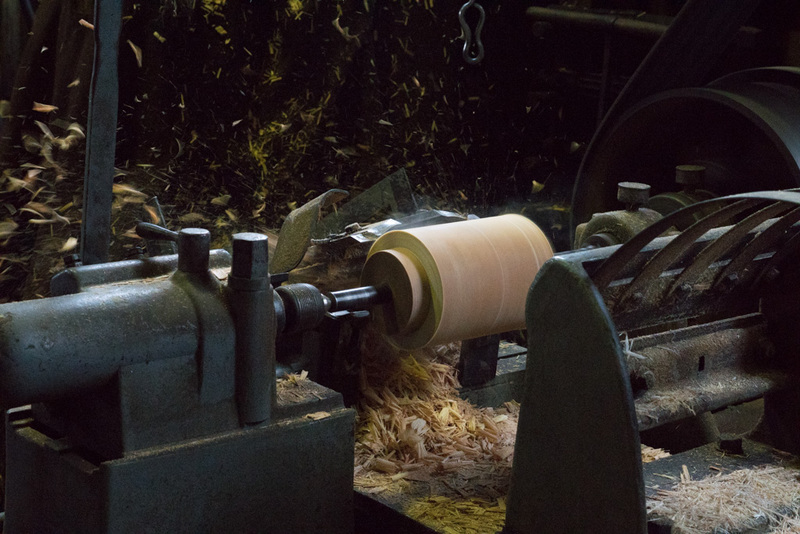 If the workshop has a quality supply of good timber, and the required equipment, the rim timber can be steam-bent in to half, or quarter rounds. This is a great technique, as it ends up with very strong members, that have the grain running around the rim. 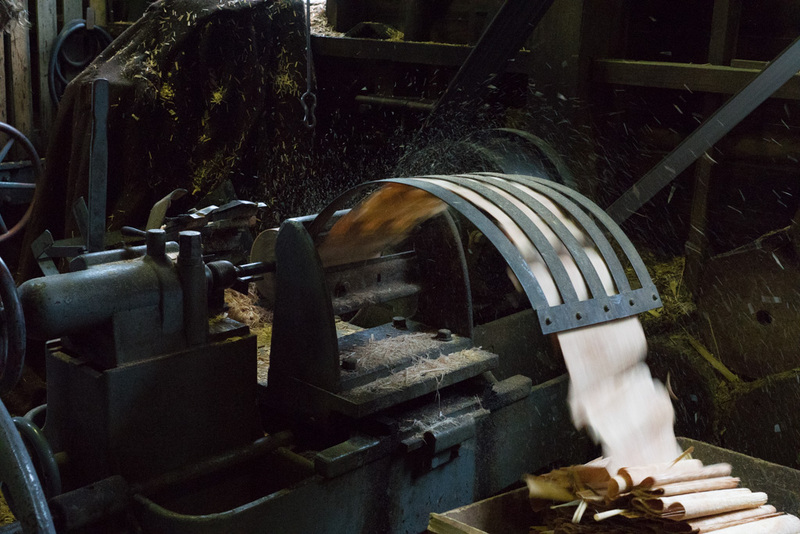 However, if the timber supply is limited or steam bending is not available, much shorter sections can be used that tie two spokes together, and this is repeated around the circumference. These are called felloes, and are typically cut out on a bandsaw. They are held against the spokes, and the locations marked, then drilled. 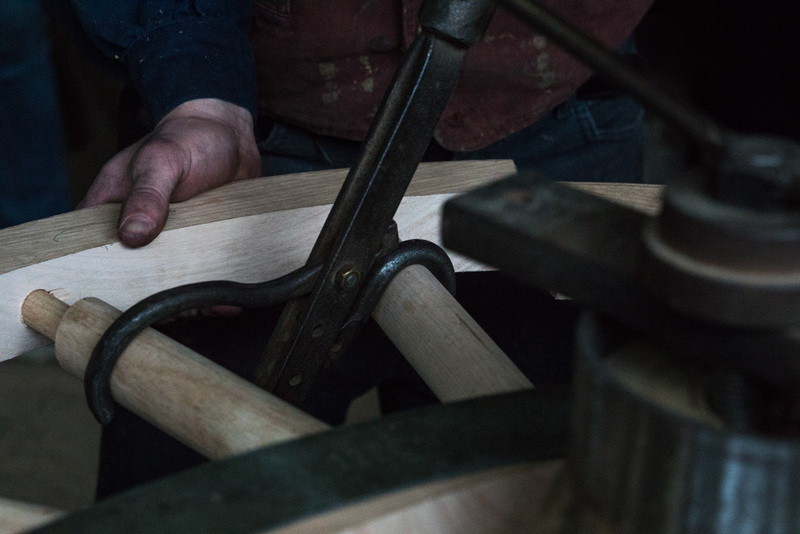 Getting the felloe attached to the spokes is a bit tricky, given they are drilled for their final location, up against the shoulder of the tenon rather than the larger diameter of the end of the tenon. To fit these on then, another tool is needed to pull the spokes apart so they can engage the holes, before being driven home. The gap between each felloe is quite small, but even so, a tenon saw is used to cut in between the gap to ensure the joint can close up fully. The steel tyre is the final part, and this gives the wheel its real strength. In an older process, the steel tyre is cut shorter than is needed. This is calculated as a combination of the size of each gap between felloes, and a fudge factor that comes from the experience of the wheel wright. A metal bender is used to bend the steel into the required diameter hoop, and the ends are then forge-welded together. 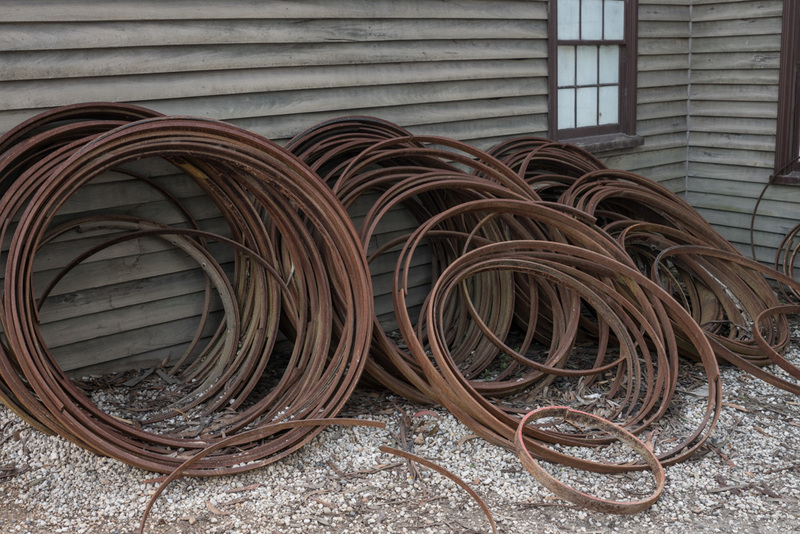 I am not sure what the pile of hoops outside the workshop is for – tyres are normally cut to match to the individual wheel, not in bulk. With the undersized tyre, the next step is to get it to fit on the wheel. This is done by heating to a black heat in a fire, which increases the diameter of the metal hoop, sufficient to be able to fit over the wheel. The wheel is placed in a pit with shallow walls, surrounded by barrels of water. The tyre is dropped over the outside of the wheel, and before it has a chance to cause the rim to start to burn, the barrels of water are kicked over, flooding the wheel and cooling the rim. If the rim had burned, it would have resulted in a layer of carbon, and a great opportunity for the steel tyre to slip off the rim. 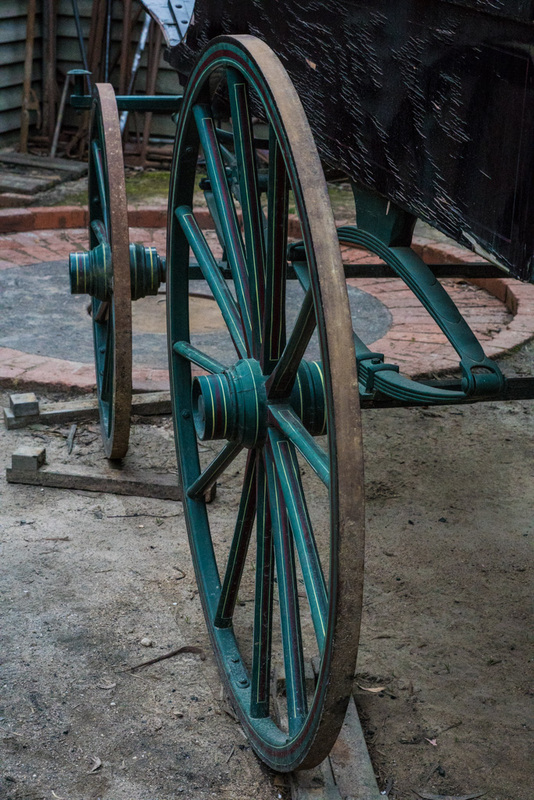 You can see an example of a pit behind these carriage wheels. 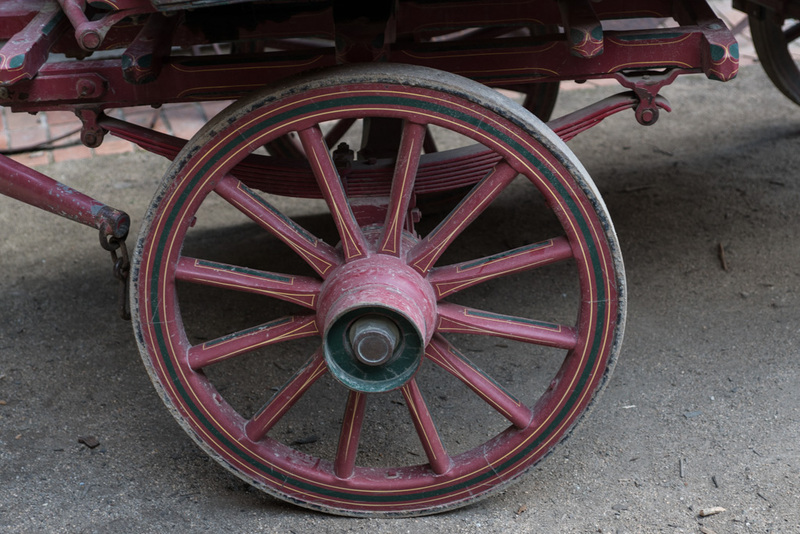 Some wheels are designed to have a bit of curvature – this provides additional capability of the wheel to flex, which also takes some of the forces that the wheel will encounter in use. 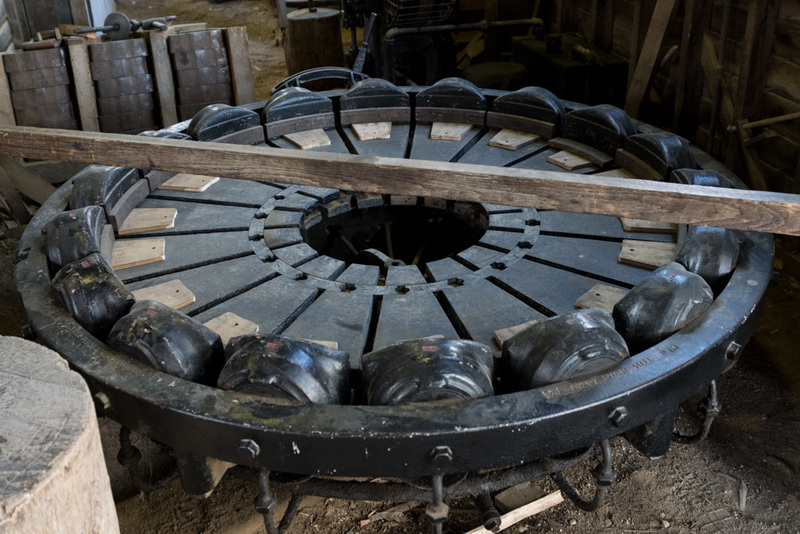 Sovereign Hill has a rim press to fit tyres a lot easier than the fire-method. These are more for wheels that are aesthetic (cosmetic), rather than functional. The tyre is larger than the diameter of the rim, and the rim press compresses the tyre onto the rim. They have had fun with this press, including trying to see what would happen if they kept going and going. Not surprisingly, the wheel failed, which each spoke snapping at the weakest point. 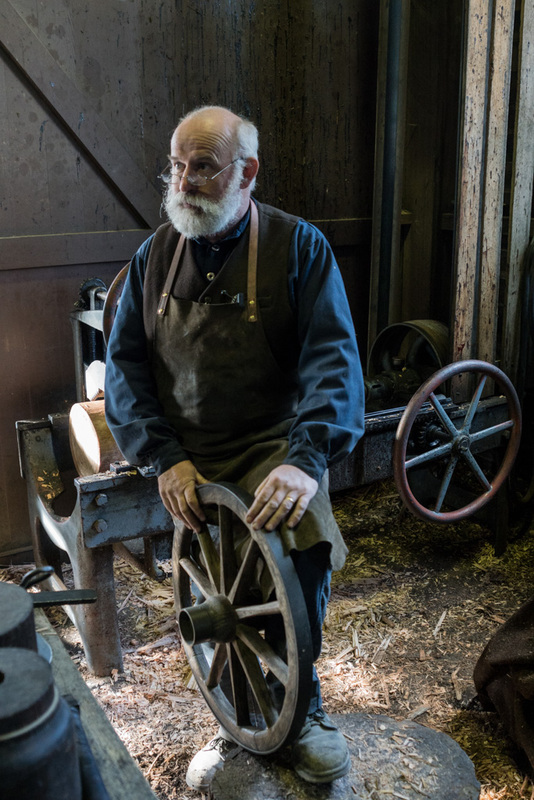 So that is the story of carriage wheel manufacture at Sovereign Hill, or at least as much as I was able to absorb from watching their demonstration. The associated video is in the next post, and it is as good as I could get, shooting handheld in the middle of a large crowd of jostling people. 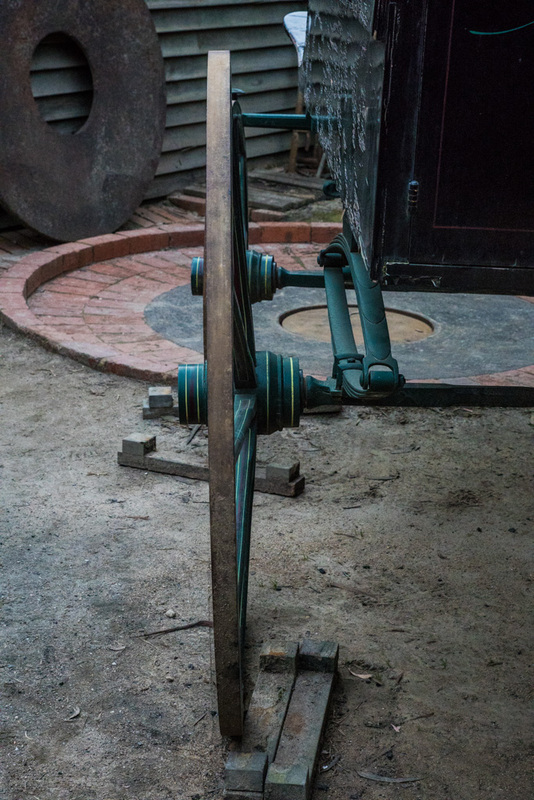 Following that, I’ll put up another post, showing a certain 4′ carriage wheel that I purchased from the place, made with all the traditional techniques.